Increased sedimentation in surface waters due to anthropogenic activities can lead to the deterioration of salmonid spawning habitat through infiltration of excessive fine sediment into redds. This study assessed the effects of sediment on salmonid reproductive habitat on Prince Edward Island, Canada by evaluating egg survival and fry length using brook trout egg in situ incubations. In-stream egg incubators were buried in the substrate of streams in three watersheds with between 10 and 69% agricultural land-use during 2012-2013 and 2013-2014. Accumulated incubator sediment load and associated particle size, incubator organic matter and stream parameters temperature, velocity, bed sediment and particle size were measured over the period of study. There was no significant difference in embryo survival among watersheds. Survival was not related to fine sediment; instead, it increased with higher average temperature that was in turn associated with the presence of groundwater upwelling in the stream. The size of the fry was also not significantly different between watersheds with varying agricultural activity. Fry length was most strongly related to sediment organic matter content. Brook trout are widespread in PEI rivers, including in many rivers that have high sediment loads due to intensive agricultural land use. This species may avoid the adverse effect of fine sediment through their natural adaptation of using groundwater upwelling for spawning. Sediment erosion, deposition and movement occur naturally in all aquatic systems (Waters, 1995). Anthropogenic activities such as agriculture, forestry, mining, and urban development have accelerated the rate of this process, and sediment is recognized globally as a major pollutant to surface waters (Waters, 1995). Excessive sediment in surface waters has a broad range of adverse effect on biotic communities, including reducing fish diversity and lowering the biomass of aquatic species (Waters, 1995). In spite of these broad-scale effects, most of the concern surrounding fine sediment has focused on the effects of excess sediment on fishes, particularly through the deterioration of spawning habitat, and sedimentation has been identified as a potential factor limiting fish reproduction and recruitment in streams (Lisle and Lewis, 1992). A large proportion of the published literature has been directed towards species from the Salmonidae, due to their economic significance and their susceptibility to the deleterious effects of fine sediment associated with their spawning behavior (Chapman, 1988; Kemp et al., 2011; Waters, 1995). Species of this family, such as brook trout (Salvelinus fontinalis) and Atlantic salmon (Salmo salar), use stream gravel as spawning habitat and incubate their eggs in constructed nests in the gravel called redds. Fine sediment, defined as particles of < 1 mm or < 2 mm in diameter (Crisp, 1996), has been known to infiltrate spawning substrate and reduce the survival and emergence of incubating salmonid embryos (Chapman 1988; Crisp 1996). Fine sediment restricts intra-gravel water flow, thus reducing the delivery of oxygen to developing embryos, and reducing the removal of metabolic waste from the redd (Chapman, 1988; Crisp, 1996; O’Connor and Andrew, 1998). Fine sediment can also physically inhibit the emergence of fry from the substrate, further reducing reproductive success (Chapman, 1988; Crisp, 1996; Soulsby et al., 2001). While restriction of oxygen can cause death of the developing embryo in the worst case, restricting flow can also cause potential impairment in energy untilization leading to fry that are smaller and thereby less fit (Witzel and MacCrimmon, 1983). Salmonid spawning gravel is considered to be of poor quality if fine content exceeds 15% (O’Connor and Andrew, 1998). Intensive agriculture has been shown to be an important source of increased sediment load (Alberto et al., 2016). On Prince Edward Island (PEI), a province on the eastern coast of Canada, crop farming is a prominent practice, and approximately 2,400 km2 (representing approximately 40% of the area of the province) has been cleared for this purpose (PEI Department of Agriculture and Forestry, 2015). Potato production has dominated the agricultural sector, with 36,017 and 36,503 ha planted in 2013 and 2014, respectively, accounting for approximately 25% of potato production in Canada (Statistics Canada, 2015). Since current potato farming practices on PEI commonly includes fall plowing, which leaves soils bare for extended periods of time, this type of row crop increases the risk of soil erosion and sedimentation (DeHaan 2002). Combined with the highly erodible nature of sandy PEI soils, soil loss is high, and has been previously estimated at 21 and 38 tonnes per ha per year in areas of pasture and crop rotation, respectively (Kachanoski and Carter 1999). Sedimentation is of particular concern on PEI because of its potential to impact spawning habitat for native salmonids, namely brook trout and Atlantic salmon (Merz et al., 2004; Curry and MacNeill, 2004). While brook trout remain widespread on PEI, Atlantic salmon is only present in about one third of its former rivers (Cairns and MacFarlane, 2015) and its decline has been attributed to a variety of factors, including excessive sedimentation (Guignion et al., 2010). In contrast to the situation on PEI, there is evidence of the decline of brook trout in other parts of the world that has been attributed to landscape alteration (Stranko et al., 2008). Thus, the study of the impacts of sedimentation on brook trout spawning can provide some insight into the persistence of this species on PEI despite the seemingly adverse conditions. The objective of this study was to assess the effects of deposited sediment on brook trout survivorship and fry length on PEI. This study tested the hypothesis that sediment is a limiting factor in salmonid egg survival to hatching and emergence. Survival was assessed by placing in-stream egg incubators in three watersheds with varying degrees of agricultural land-use during two separate spawning seasons. Eggs were monitored for hatching and swimup over the early spring months and the relationship between survival and fine sediment accumulated within the incubators was assessed. 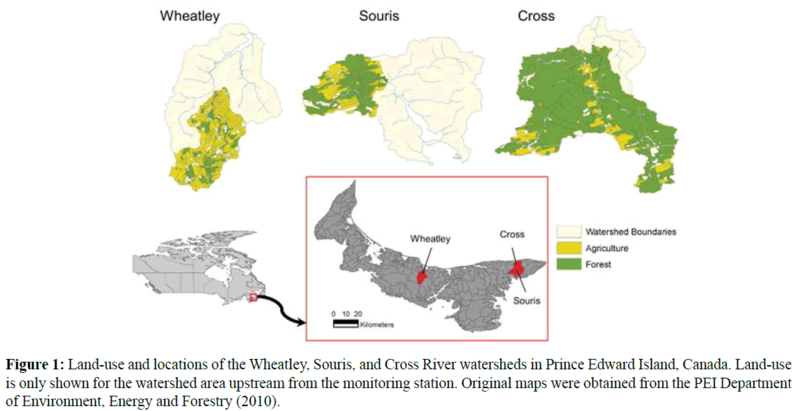 Three rivers on PEI with varying degrees of agricultural landuse within the watershed were selected for the study: Wheatley, Souris, and Cross Rivers. Wheatley River, located in the central portion of the island, had the highest amount of agricultural activity in the watershed, while the Souris and Cross Rivers, located in the eastern portion of the island, had intermediate and lowest levels of agriculture (Table 1 and Figure 1). Detailed characterization of the sediment load in these watersheds is provided in Alberto et al. (2016). Each river has a population of brook trout. Three sites were selected within each river, mostly at locations where there was evidence of current spawning. In the absence of current spawning within the study site, the study sites were selected where there were large areas of suitable gravel-sized spawning substrate (~2-5 cm in diameter). Table 1: Summary of the sub-watershed parameters for selected sites. Land use, surficial geology and slope were extracted with Arc GIS v.10.2 from land-use, surficial geology, and digital elevation maps, respectively, obtained from the PEI Department of Environment, Energy and Forestry (2010). Figure 1: Land-use and locations of the Wheatley, Souris, and Cross River watersheds in Prince Edward Island, Canada. Land-use is only shown for the watershed area upstream from the monitoring station. Original maps were obtained from the PEI Department of Environment, Energy and Forestry (2010). A minimum of six female and six male brook trout were collected by electrofishing in late November 2012 and 2013 from the Morrel and West Rivers, PEI, Canada, respectively, and transported to a temporary laboratory in a 10°C holding tank. Broodstock were held in large tanks and individuals who were not ripe for spawning were injected with Ovaprim (Syndel Laboratories Ltd., Nanaimo, BC) to induce spawning. The fish were spawned using the dry fertilization technique where the eggs and milt were stripped from the fish by gently pressing on their abdomen (Piper et al., 1986). The eggs were pooled to minimize variability arising from genetic differences. From this point forward, the 2012-2013 and 2013-2014 field seasons will be referred to as the 2013 and 2014 field seasons, respectively. Following dry-spawning, eggs were separated into batches of approximately 100 eggs and placed on ice for transportation to the study sites. Eggs were placed in incubators and buried within the first 30 hours of fertilization. A set of control eggs were kept in a Hot incubator at 5°C and monitored in order to assess the viability of the eggs and timing of hatching/swim-up under ideal conditions. Two types of egg incubator designs were used to assess survival in this study: a pipe incubator with an emergence trap and a tray incubator. The first design was a 10 cm diameter PVC pipe, capped at both ends, with three 2 mm plastic mesh windows (~10 ×15 cm) (modified from Cunjak et al., 2002). In the 2014 field season, the 2 mm mesh was replaced by 1 mm mesh. The top cap of the incubator was removable, and a small emergence chamber could be attached to the unit in the spring to collect the fry at emergence. The second incubator design was a Jordan- Scotty salmonid incubator (Scotty Plastics Ltd., BC, Canada), normally used for salmonid stocking, retrofitted with fabric mesh on both sides to prevent alevin escape. Jordan-Scotty incubators could only assess survival before emergence as the movement of fry is confined to the substrate and fry cannot swim-up into an emergence chamber as in the pipe incubator design. The Jordan- Scotty incubators were only used in the 2014 field season. The two incubators measure distinctly different endpoints, the Jordan- Scotty incubators measure survival to hatch only, whereas the PVC pipe incubators measure emergence of fry from the gravel. Incubator locations were chosen to be in close proximity (< 10 m) to wild brook trout spawning. Three locations were chosen in the main stem (defined as the portion of stream that drained directly into the estuary, e.g. stream order did not change between these point and the estuary) of each stream (30-400 m apart) and within those stations, three replicates per incubator type were buried in a cluster <1 m from each other for a total of nine incubators of each type per sub-watershed. The pipe incubators were filled with sterilized (oven baked at 150°C, 3 hours) river-washed granite from Nova Scotia, Canada ranging from 2-4 cm in diameter to provide optimal substrate size for brook trout (Reiser and Wesche, 1977). The volume of this gravel matrix was measured at the end of the study in order to calculate the proportion of fine sediment which accumulated within the voids. Fertilized eggs were carefully layered between the gravel in the incubator in such a way that they would remain 5-10 cm in depth when buried as seen in natural redd construction (<15 cm in DeVries 1997). Incubators were placed upright in the streambed and the excavations were filled with sieved gravel from the respective sites. The Jordan- Scotty incubators were buried in a similar fashion, assuring that the entrance holes to the units were placed parallel to the stream water flow. The incubators were left in the river from November of the spawning year until emergence began in mid-April to early- June. At the first sign of emergence (Wheatley: April 15th, 2013 and April 29th, 2014 Souris: May 8th, 2013 and May 20th, 2014; Cross: May 8th, 2013 and June 3rd, 2014), the tray incubators were pulled from the stream, placed in bags and brought back to the laboratory for analysis. Emergence chambers were attached to the pipe incubators in mid-April to capture emerged fry that were anaesthetized in a solution of MS-222 (Argent, WA, USA), preserved in ethanol (80%) and brought back to the lab for analysis. The fry were examined for deformities and total length was recorded. At the termination of the emergence period (Wheatley: May 9th, 2013 and June 20th, 2014; Souris: May 31st, 2013 and July 2nd, 2014; Cross: June 6th, 2013 and July 2nd, 2014) the pipe incubators were pulled from the river and brought back to the laboratory for analysis. The contents of the incubators were examined for remaining live alevins, dead alevins, and dead eggs to calculate survival totals. Fine sediment within the incubators (<2 mm) was sieved, dried (60°C, 24-48 h) and weighed to determine the percentage of fines accumulated through the incubation period. Three subsamples were taken from the dried fine sediment and heated in a muffle furnace (Fisher Scientific, Model 650-126) to ignite the organic matter within the sample for determination of organic content (400°C, 6 h). The particle size distribution (D50, median diameter of particle size distribution) was determined by laser diffraction (Malvern Mastersizer 2000, Hydro 2000S). In 2013, the fine sediment naturally present in the stream bed at the incubator sites was compared to the amount of fines accumulated within the incubators by taking core samples (~15 cm deep) next to the incubators in each river with a McNeil core sampler within a week of the incubator removal (McNeil and Ahnell 1964). Fine sediment fractions from the cores were separated using a series of wet sieves (mesh sizes 1 mm and 2 mm). Water from the wet sieve series was retained in buckets and the fine sediment <1 mm was left to settle for 3-4 weeks before siphoning out the top layer of water to collect the settled sediment due to the significant volume of water still present. All sieved sediment fractions were dried in a drying oven (60°C, 24-48 hours) weighed, and organic matter content and particle size of three subsamples determined. A temperature logger (Onset HOBO Temperature Logger) was placed in one pipe incubator per site at each river (total of 3 per river) for the duration of the incubation. Temperature was assumed to be similar for all incubators at the same site and was averaged over the entire incubation period (ending on May 7th for both years, the date that the first incubator was removed). Water velocities directly upstream of each incubator were measured during biweekly site visits with a Marsh-McBirney FlowMate 2000 velocity meter. Water velocity readings were averaged across the entire incubation period. Survival estimates of the embryos in the field adjusted based on the viability of the laboratory incubated eggs in each year. For example, the nominal number of eggs in each incubator was 100, so in 2014 when egg viability was 95%, survival estimates would have been based on the number of emerging fry (in the case of the PVC incubators) divided by 95 viable eggs. Levene’s and Brown Forsythe tests were used to determine homogeneity of variance of data, while normality was assessed visually using normal probability plots. Data that did not conform to the appropriate parametric assumptions based on these tests were log transformed prior to statistical analysis. Differences in environmental variables (e.g. temperature, organic matter, D50, etc.) within the incubators and streambed core samples were examined with ANOVA, followed by a post-hoc Tukey’s test. 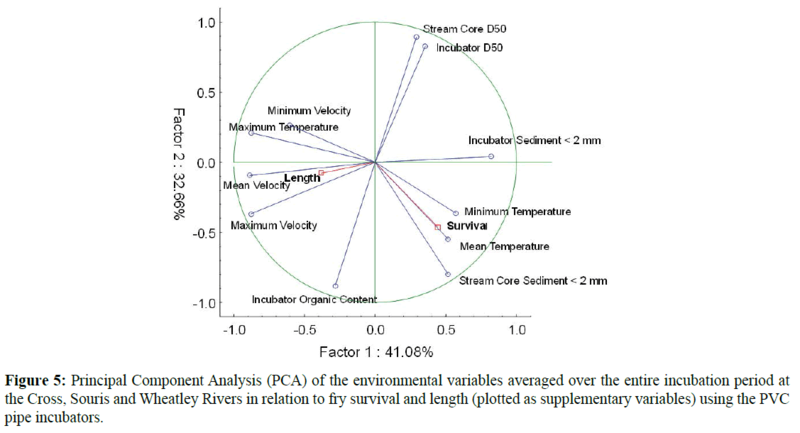 A one-way nested ANOVA (station nested within river) was used to examine differences in egg survival and fry length between rivers for both incubators types and between years. The mean square of station nested within river was used to calculate the F-statistic to examine the hypothesis of differences in survival and length between rivers. A preliminary examination of the nature of relationships among environmental variables, survival and length was explored through a principal components analysis of the entire dataset from all rivers. This was done in order to reduce the number of variables, particularly redundant ones in order to examine these date with multivariate regressions. Only the highest loading variable in each category (e.g. temperature) was chosen for subsequent multivariate regression. For all PCA and regression analysis, normality of variable was tested as previously described. Data that was not sufficiently normal was log transformed (only the temperature parameters). Data from individual incubators was used with the exception of temperature for which the data for each station was applied to all three incubators at that station. A subset of variables within each category (e.g. velocity, temperature, sediment) was chosen for further multivariate regression analysis based on those that loaded most strongly to a principle component axis. Forwards stepwise regressions were used to identify the environmental predictor variables that best predicted survival and embryo length. All statistics were performed in STATISTICA v. 8.0 using an experiment-wide alpha of 0.05. There were no significant differences in the environmental variables and incubator sediment accumulation or particle size between rivers in either 2013 or 2014 as determined by oneway ANOVA (Table 2). While no overall stream temperature differences were observed, there was a considerable range (2- 8°C) in mean temperature between stations. Data for some of the warmer sites, particularly in the Wheatley River were remarkably constant in temperature with almost no daily fluctuation as compared to stations with low mean temperature that tended to have daily fluctuations of about 2°C (Figure 2) indicating that Wheatley incubators had been placed in groundwater upwelling as groundwater on PEI is typically 7-8°C all year around (Kynsh et al., 2016). Table 2: Mean values (SD, n – number of stations within a river for which there was at least one incubator) for the measured parameters within the pipe and Jordan-Scotty incubators over the incubation period in 2013 and 2014. There were no significant differences between environmental and sediment parameters between rivers within years. Figure 2: Temperature (°C) in two PVC pipe incubators during the study 2014 field season in the Wheatley and Souris Rivers. Sediment accumulation within the incubators was compared to the adjacent streambed by examining sediment core characteristics. For all three rivers, the mass of the fine sediment <2 mm was significantly higher in the streambed core samples than in the pipe incubators in 2014 (volume of core sample was comparable to the volume of the pipe incubators, ~1570 cm3 for both). Significantly less accumulation of fine sediment (< 2 mm) was seen in the Cross River core as compared to either Souris or Wheatley River core samples (Table 3). The particle size distribution of the fine fraction (< 2 mm) of the cores was found to be significantly different across all rivers, with Wheatley being the finest, and Souris being the coarsest. However, when the full size range of substrate was examined, the Cross River had the largest median substrate size. Table 3: Mean values (SD, n) for the sediment parameters from the streambed cores taken within a week following incubator removal (late June/early July 2014). Different superscript letters indicate significant differences in core parameters between sites (columns). In 2013, laboratory survival to swim-up (when the yolk sac was completely absorbed) was 43% while in 2014, survival was 95%. Survival to hatch in the Jordan-Scotty incubators ranged from 6.3- 88% in individual incubators across the three rivers studied in 2014, the only year that these types of incubators were used (Table 4). There were no significant differences in egg survival or fry length between rivers as determined by nested ANOVA (Table 4). As variability between incubators within the same stream was high it was likely that incubators were being influenced by environmental factors closely associated with the chosen incubation stations. To examine this, multivariate techniques were used to initially explore the relationship between environmental conditions and survival and length of embryos. A principal components analysis (PCA) suggested a correlation between survival and temperature, and length and sediment (Figure 3). Approximately 32% of the variability in the environmental variables was attributed to the first principal component and 30% to the second principle component. Minimum, maximum and average temperature weighed heavily in the first component and seemed related to survival. Incubator fines D50 and organic matter content weighed heavily in the second component and seemed most related to fry length. Typically, variables of a similar nature, e.g. temperature, velocity, sediment were highly correlated and one variable from each category was chosen for further analysis based on the strength of loadings to PC1 or PC2. In the case of the Jordan-Scotty inbubators this was minimum temperature, maximum velocity, stream core D50, incubator organic content, and incubator sediment <2 mm. Table 4: Mean ± SD values for embryo survival (corrected for survival in laboratory) (range, n) within an incubator to hatching and emergence and fry length (range, n). Note that all means, ranges, and n are for the means at individual stations at which there was at least one incubator. 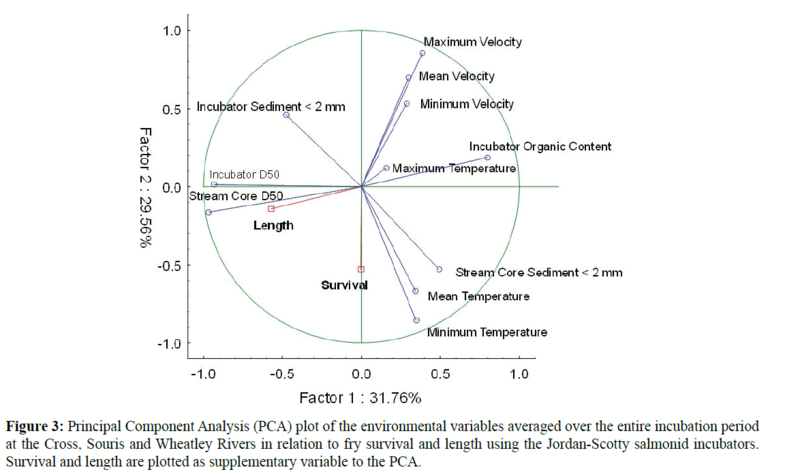 Figure 3: Principal Component Analysis (PCA) plot of the environmental variables averaged over the entire incubation period at the Cross, Souris and Wheatley Rivers in relation to fry survival and length using the Jordan-Scotty salmonid incubators. Survival and length are plotted as supplementary variable to the PCA. Subsequently, a forward stepwise regression model was used to identify the best subset of environmental variables accounting for the variability in egg survival and fry length. For egg survival only minimum temperature showed a statistically significant relationship with survival (adjusted R2=0.37). Fry survival increased with minimum temperature. For fry length, only incubator organic content was significantly inversely related to length (Figure 4a and 4b). Figure 4: Relationship between a) survival and mean temperature (°C), and b) organic matter content (mg/g dry W) and fry length (mm) for the Jordan-Scotty salmonid incubators in 2014. PVC pipe incubators that were completely buried (emergence traps could not be attached to buried incubators) or entirely exposed by moving sediment and these were removed from the statistical analysis as there was not survival. Survival to emergence ranged from 2.3-27.9% across all incubators in all rivers studied in 2013 and 1.1-23.2% in 2014 (Table 4). There were no significant differences found in egg survival or fry length between either the three rivers or between the two field seasons as determined by nested ANOVA. As such, 2013 and 2014 data were pooled for further analysis. An exploratory PCA revealed a potential relationship with survival and temperature (Figure 5). As with the Jordan-Scotty incubators, many of the environmental variables were correlated within variable type (e.g. temperature) and only five were used for subsequent analysis based on the highest loading to the respective principle component axis: mean temperature, mean water velocity, incubator organic matter content, stream core sediment <2 mm, and stream core D50. A forwards stepwise regression model indicated that the most predictive model for egg survival included only one statistically significant factor, temperature (adjusted R2=0.74). As seen in the Jordan-Scotty incubators, survival increased with increasing temperature in the pipe incubators (Figure 6). Stepwise regression could not find a significant relationship between fry length and any of the variables examined. Figure 5: Principal Component Analysis (PCA) of the environmental variables averaged over the entire incubation period at the Cross, Souris and Wheatley Rivers in relation to fry survival and length (plotted as supplementary variables) using the PVC pipe incubators. 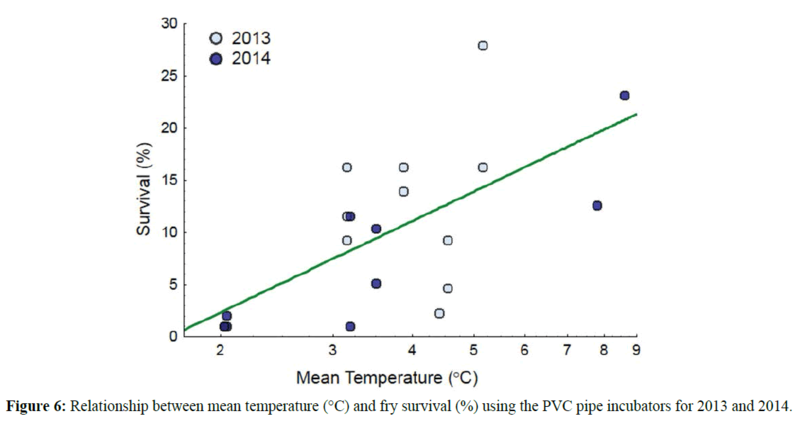 Figure 6: Relationship between mean temperature (°C) and fry survival (%) using the PVC pipe incubators for 2013 and 2014. There were no differences in the amount of fine sediment that accumulated in the incubators between watersheds despite a seven-fold difference in the proportion of agriculture within the watershed. Despite the substantial differences in the intensity of agricultural activity amongst the watersheds, there was no significant difference in survival or fry length amongst rivers. Evaluation of the environmental parameters to which the eggs were exposed in individual incubators showed that temperature was the consistent predictor of embryo survival in both incubator types. Relationships between environmental variables and fry length were not as consistent though sediment organic content was inversely related to fry length in the Jordan-Scotty incubators. Previous studies attempting to relate stream sediment to salmonid survival have shown inconsistent results when trying to relate egg survival to sediment variables. O’Connor and Andrew (1998) found no correlation between sediment accumulation in the incubators and Atlantic salmon egg survival (assessed right before emergence, or pre-emergence) in the field. Although the mean fine accumulation within the incubators in their study (13.6%) was similar to that of the present study, the authors defined fine sediment as particles <1 mm. Another study on salmonids on PEI (Cunjak et al., 2002) also found no relationship between fine sediment accumulation (<2 mm) and salmonid (brook trout and Atlantic salmon) egg survival to emergence. Similarly, Levasseur et al. (2006) found no relationship between Atlantic salmon survival to pre-emergence and total percent of fines <2 mm in artificial redds. However, their study showed that the proportion of silt and very fine sand (<0.125 mm) explained 83% of the variability in embryo survival. Furthermore, they reported a threshold of approximately 0.2% silt and very fine sand above which survival dropped suddenly below 50%. This threshold is smaller than the proportions of silt and very fine sand found within the incubators in the present study, which ranged from 19-63% in 2013 and 13- 75% in 2014. Although the present study could not establish a threshold for fine sediment, other studies like Levasseur et al. (2006) have established levels at which survival of salmonids eggs is significantly decreased. A laboratory assessment of brook trout by Franssen et al. (2012) found low survival in substrate when the percent finer than 2 mm was above 22%. Hausle and Coble (1976) found that survival to emergence of brook trout declined when the amount of fines <2 mm was over 20%. O’Connor and Andrew (1998) defined poor salmonid spawning gravel as substrates containing over 15% fines <1 mm. Temperature rather than sediment was the key variable in brook trout egg/embryo survival. PEI streams are dominated by groundwater and groundwater seeps and PEI springs have a temperature of just over 7ºC throughout the year, reflecting the mean annual temperature of the region (Knysh et al., 2016). Increased survival at warmer stations may have been due to increased oxygen supply from the upwelling water as groundwater on PEI is always oxic (Kynsh et al., 2016). However, differences in temperature may have beneficial effects on survival, independently of oxygen. Water temperature affects the length of the incubation period and rivers with warmer waters typically have shorter incubation periods. The length of exposure time to fine sediment has been identified as a significant factor in salmonid survival (Cocchiglia et al., 2012). In their field assessment of brown trout (Salmo trutta) egg survival, Cocchiglia and colleagues (2012) found that sediment exposure time was a significant factor in survival, and that survival generally decreased as exposure time increased. Survival of brown trout eggs in the lower fine sediment treatment (10% <0.085 mm) was only negatively impacted after 3 weeks of incubation, in contrast to the higher sediment treatment (40%, <0.85 mm) where negative effects were seen within the first week (Cocchiglia et al., 2012). Thus, it is possible that potentially shorter incubation times, due to warmer water temperatures in the present study, also lead to increases in the survival of the brook trout eggs. The reproductive success of brook trout on PEI in the face of intensive agriculture is likely related to their selection of areas of groundwater discharge for spawning. Wild brook trout have remained ubiquitous across PEI (Guignion et al., 2010) thriving in many highly agricultural area. While this trait has likely developed to maximize the oxygen availability to the eggs, choosing redds locations in groundwater upwelling may also have conferred the advantage of minimizing exposure to fine sediment. Curry and Noakes (1995) determined that brook trout spawned exclusively in areas of groundwater upwelling in Canadian Shield waters. Curry and MacNeill (2004) had similar findings to the present study, where the survival to emergence of brook trout and Atlantic salmon on PEI was higher in regions of groundwater upwelling. Reduction of sediment accumulation due to groundwater flushing does not appear to be the case in this study, as the percentage of fines accumulated in the incubators in regions of upwelling was similar to the accumulation in those that were not. However, incubators may artificially create depositional areas even when in an area of upwelling. This was perhaps one reason why the Jordan-Scotty incubators were more successful than the PVC pipe incubators as they allow for better flow directly to the eggs through the incubator as the flow path is vertical for the Jordan- Scotty Incubators, and horizontal for the PVC pipe incubators. In strongly groundwater fed streams, survival may not be related to the amount of fine sediment accumulation. A study on rainbow trout (Oncorhynchus mykiss) found that survival depended greatly on the oxygen content and the groundwater velocity within redds (Sowden and Power, 1985). Additionally, measures of substrate size composition in their study were not related to oxygen content within redds, and were weakly associated to seepage velocities. Normally, increased proportion of fines relative to coarser sediments leads to decreased intragravel flow velocities thus hindering oxygen delivery to the eggs and preventing the removal of metabolic wastes (Chapman et al., 2014). However, it is suggested that embryonic survival is dependent on the impact of fines on the supply and delivery of oxygen to the developing eggs (Greig et al., 2005). Differences in survival between incubator types potentially indicates that the brook trout eggs are surviving to hatching, but do not successfully emerge. While it could not be measured, it is possible that the lack of emergence was due to fine sediment acting as a physical barrier and restricting the movement of the fry at swim-up. Fudge et al. (2008) determined that sediment during laboratory incubation did not affect oxygen delivery to the incubating eggs, rather it restricted the movement of the fry and precluded emergence. Another laboratory assessment by Franssen et al. (2012) had similar findings, where substrate with a high proportion of fines precluded the emergence of brook trout fry. Witzel and MacCrimmon (1983) reported an increase in survival from 2-96% in substrates between 60-20% sand mixtures due to reduced entrapment. Using incubation baskets similar to this present study, Cunjak et al. (2002) noted the formation of a sediment plug at the top of the incubation device which may have hindered emergence. It is possible, however, that a layer of fine sediment was deposited towards the top of the incubation device, hindering emergence, as seen by Cunjak et al. (2002). Sediment characteristics can affect the ability of the embryos to convert stored energy into larval growth. Both organic matter and presence of increased amounts of sediment could adversely affect length, since organic matter and fine sediment were highly correlated, and it is difficult to separate the influence of these individual variables. The strong correlation between these two variables and the correlation between organic content and larval size may relate to oxygen availability. Increased organic matter content reduces the availability of dissolved oxygen through biological oxygen demand during decomposition (Greig et al., 2005; Greig et al., 2007). Similarly, the accumulation of fine sediment is known to reduce gravel permeability and thus the rate and efficiency of oxygenation (Greig et al. 2005). A study by Witzel and MacCrimmon (1983) concluded that a larger gravel proportion, combined with a lower sand concentration produced the largest and most developed alevins of brown trout in a laboratory assessment. It is widely accepted that decreased intra-gravel oxygen concentrations reduces embryonic survival as well as reduces growth, the efficiency of yolk sac conversion, and causes premature hatching and emergence (e.g. Chapman, 1988; Mason, 1969; Crisp, 1996). It is not known whether organic matter infiltrated into the incubators, or if the increased organic matter is reflective of increased bacterial biomass that was produced within the incubators. If bacterial biomass is higher in proportion to higher sediment organic content, bacterial decomposition may reduce oxygen in the sediments. Nutrient concentrations in bubbling springs adjacent to agricultural areas are also high in PEI (Knysh et al., 2016). Although not measured here, nutrients from agricultural runoff may certainly contribute to the establishment of organic matter in the incubators in the Wheatley and Souris Rivers through stimulating bacterial production, which typically had the highest organic matter content. Small grain size and organic matter have frequently been observed to correlate strongly in estuarine and lentic environments (López et al., 2016, Pelletier et al., 2011), however, riverine environments are more complex due to their dynamic nature. It has been shown that fine sediment can carry more organic matter from eroded soils (Li and Pang, 2014) which could explain the strong relationship between them in this study. However, it has also been suggested that sediment organic matter mineralization may play a part. Greater oxygen availability, which may occur with larger substrate particle size may lead to greater mineralization and less organic content in sediment (López et al., 2016). However, there are other studies that contradict the hypothesis that sediment accumulation reducing oxygen availability relates to production of smaller fry. Argent and Flebbe (1999), reported little changes in brook trout fry length; rather they reported a general decline in fry mass with increasing fines. Fudge et al. (2008) observed that the temporal pattern of rainbow trout emergence in the laboratory was affected by increased sediment loads. In their high sediment load treatments, an initial increase in emergence was deemed to be a stress response due to elevated CO2 concentrations. Although fry condition can be affected by early emergence, the authors found that the condition factor of the fry was unaffected by sediment. These varying conclusions of the effect of fine sediment on fry quality highlight the complex relationship between sediment composition and oxygen levels. Despite extensive agricultural land-use coupled with local geological conditions leading to high erosion and stream sedimentation on PEI, brook trout thrive in nearly every stream on PEI. This suggests that PEI brook trout have mechanisms to adapt to or avoid fine sediment stress during the incubation period. It is believed that the success of local brook trout may be facilitated by the ubiquitous upwelling water in the province’s groundwaterfed rivers. However, more research is needed to draw further conclusions on the selection of groundwater upwelling sites for spawning and the potentially increased egg survival in these areas. Unlike the brook trout, the Atlantic salmon is no longer present in much of its natural range on PEI and tends to thrive in watersheds with lower land-use stress (Guignion et al., 2010). The Atlantic salmon depends more on high water velocity and large substrate rather than upwelling for spawning in order to improve the ventilation and structure of the redd (Armstrong et al., 2003). The decline of Atlantic salmon on PEI may be attributed, in part, to their susceptibility to the deleterious effect of fine sediment in spawning substrate. Nevertheless, the results of the present study suggest that, of the factors allowing PEI brook trout to survive and grow, fine sediment alone cannot be used as an indicator of the quality of spawning habitat for this species, especially in groundwater-fed streams similar to PEI. This work was supported by a grant from the Canadian Water Network’s Canadian Watershed Research Consortium, by funding from Fisheries and Oceans Canada, and by the PEI Department of Communities, Land and Environment. MRV was supported by a Canada Research Chair. The authors wish to thank Christina Pater, Michael Coffin, Scott Roloson and Fred Cheverie for their assistance. Alberto, A., St-Hilaire, A., Courtenay, S.C., van den Heuvel, M.R. (2016) Monitoring stream sediment loads in response to agriculture in Prince Edward Island, Canada. Environmental Monitoring and Assessment 188, 415. Argent, D.G., Flebbe, P.A. (1999) Fine sediment effects on brook trout eggs in laboratory streams. Fisheries Res 39, 253-262. Armstrong, J., Kemp, P., Kennedy, G.J., Ladle, M., Milner, N. (2003) Habitat requirements of Atlantic salmon and brown trout in rivers and streams. Fisheries Res 62, 143-170. Cairns, D., MacFarlane, R. (2015) The status of Atlantic salmon (Salmo salar) on Prince Edward Island (SFA 17) in 2013. Canadian Science Advisory Secretariat (CSAS) Research Documentp: 25. Chapman, D.W. (1988) Critical review of variables used to define effects of fines in redds of large salmonids. Transactions of the American Fisheries Society 117, 1-21. Chapman, J.M., Proulx, C.L., Veilleux, M.A.N., Levert, C., Bliss, S et al. (2014) Clear as mud: A meta-analysis on the effects of sedimentation on freshwater fish and the effectiveness of sediment-control measures. Water Res 56, 190-202. Cocchiglia, L., Curran, S., Hannigan, E., Purcell, P.J., Kelly-Quinn, M. (2012) Evaluation of the effects of fine sediment inputs from stream culverts on brown trout egg survival through field and laboratory assessments. Inland Waters 2, 47-58. Crisp, D.T. (1996) Environmental requirements of common riverine European salmonid fish species in fresh water with particular reference to physical and chemical aspects. Hydrobiologia 323, 201-221. Cunjak, R.A., Guignion, D.L., Angus, R.B., MacFarlane, R.A. (2002) Survival of eggs and alevins of Atlantic salmon and brook trout in relation to fine sediment deposition. In: D. K. Cairns (Ed. ), Effects of land use practices on fish, shellfish, and their habitats on Prince Edward Island. Canadian Technical Report of Fisheries and Aquatic Sci 2408, 82-91. Curry, R.A., MacNeill, W.S. (2004) Population-level responses to sediment during early life in brook trout. Journal of the North American Benthological Society 23, 140-150. Curry, R.A., Noakes, D.L.G. (1995) Groundwater and the selection of spawning sites by brook trout (Salvelinus fontinalis). Canadian Journal of Fisheries and Aquatic Science 52, 1733-1740. DeHaan, K.R. (2002) Soil conservation in Prince Edward Island potato land. In: D. K. Cairns (Ed. ), Effects of land use practices on fish, shellfish, and their habitats on Prince Edward Island. Canadian Technical Report of Fisheries and Aquatic Sciences 2408, 20-21. DeVries, P. (1997) Riverine salmonid egg burial depths: review of published data and implications for scour studies. Canadian Journal of Fisheries and Aquatic Science 54, 1685-1698. Franssen, J., Blais, C., Lapointe, M., Bérubé, F., Bergeron, N et al. (2012) Asphyxiation and entombment mechanisms in fines rich spawning substrates: experimental evidence with brook trout (Salvelinus fontinalis) embryos. Canadian Journal of Fisheries and Aquatic Sciences 69, 587-599. Fudge, T.S., Wautier, K.G., Evans, R.E., Palace, V.P. (2008) Effect of different levels of fine-sediment loading on the escapement success of rainbow trout fry from artificial redds. North American Journal of Fisheries Management 28, 758-765. Greig, S.M., Sear, D.A., Carling, P.A. (2005) The impact of fine sediment accumulation on the survival of incubating salmon progeny: Implications for sediment management. Science of the Total Environment 344, 241-258. Greig, S.M., Sear, D.A., Carling, P.A. (2007) A review of factors influencing the availability of dissolved oxygen to incubating salmonid embryos. Hydrological Processes 21, 323-334. Guignion, D., Dupuis, T., Teather, K., MacFarlane, R. (2010) Distribution and abundance of salmonids in Prince Edward Island streams. Northeastern Naturalist 17, 313-324. Hausle, D.A., Coble, D.W. (1976) Influence of sand in redds on survival and emergence of brook trout (Salvelinus fontinalis). Transactions of the American Fisheries Society 1, 57-63. Kachanoski, R.G., Carter, M.R. (1999) Landscape position and soil redistribution under three soil types and land use practices in Prince Edward Island. Soil and Tillage Research 51, 211-217. Kemp, P., Sear, D., Collins, A., Naden, P., Jones, I. (2011) The impacts of fine sediment on riverine fish. Hydrological Processes 25, 1800-1821. Knysh, K., Giberson, D.J., van den Heuvel, M.R. (2016) The influence of agricultural land-use on plant and macroinvertebrate communities in springs in Eastern Prince Edward Island, Canada. Limnology and Oceanography 61, 518-530. Levasseur, M., Bergeron, N.E., Lapointe, M.F., Bérubé, F. (2006) Effects of silt and very fine sand dynamics in Atlantic salmon (Salmo salar) redds on embryo hatching success. Canadian Journal of Fisheries and Aquatic Sciences 63, 1450-1459. Li, G., Pang, X. (2014) Difference in organic carbon contents and distribution in particle-size fraction between soil and sediment on the Southern Loess Plateau, China. Journal of Mountain Science 11, 717-726. Lisle, T.E., Lewis, J. (1992) Effects of sediment transport on survival of salmonid embryos in a natural stream: A simulation approach. Canadian Journal of Fisheries and Aquatic Science 49, 2337-2344. López, P., López-Tarazón, J.A., Casas-Ruiz, J.P., Pompeo, M., Ordoñez, J. et al. (2016) Sediment size distribution and composition in a reservoir affected by severe water level fluctuations. Science of the Total Environment 540, 158-167. Marchildon, M.A., Annable, A.W.K., Power M., Imhof, J.G. (2012) A hydrodynamic investigation of brown trout (Salmo trutta) and rainbow trout (Oncorhynchus mykiss) redd selection at the riffle scale. River Res Applic 28, 659-673. Mason, J.C. (1969) Hypoxial stress prior to emergence and competition among coho salmon fry. Journal of the Fisheries Research Board of Canada 26, 63-91. McNeil, W.J., Ahnell, W.H. (1964) Success of pink salmon spawning relative to size of spawning bed materials. U.S. Fish and Wildlife Service, Special Scientific Report-Fisheries 469, Washington. Mertz, J.E., Setka, J.D., Pasternack, G.B., Wheaton, J.M. (2004) Predicting benefits of spawning-habitat rehabilitation to salmonid ( Oncorhynchus spp.) fry production in a regulated California river. Canadian Journal of Fisheries and Aquatic Science 61, 1433-1446. O’Connor, W.C.K., Andrew, T.E. (1998) The effects of siltation on Atlantic salmon, Salmo salar L., embryos in the River Bush. Fisheries Management and Ecology 5, 393-401. PEI Department of Environment, Energy and Forestry: Forests, Fish and Wildlife (2002) 1973 Surficial Geology. PEI Surficial Geology GIS Layer. Accessed 01 Sept. 2015. PEI Department of Environment, Energy and Forestry: Resource Inventory (2010) Corporate Land Use Inventory 2010. PEI Corporate Land Use Inventory GIS Layer. Accessed: 01 Sept. 2015. PEI Department of Agriculture and Forestry (2015) Agriculture on Prince Edward Island. Accessed 01 Sept 2015. Pelletier, M.C., Campbell, D.E., Ho, K.T., Burgess, R.M., Audette, C.T. et al. (2011) Can sediment total organic carbon and grain size be used to diagnose organic enrichment in estuaries? Environmental Toxicology and Chemistry 30, 538-547. Piper, R., McElwain, I., Orme, L., McCraren, J., Fowler, L. (1986) Fish hatchery management. Department of the Interior U.S. Fish and Wildlife Service. Washington. Reiser, D.W., Wesche, T.A. (1977) Determination of physical and hydraulic preferences of brown and brook trout in the selection of spawning locations. Water Resources Res. Inst., Univ. Wyo., Laramie. Water Res p:100. Stranko, S.A., Hilderbrand, R.H., Morgan, R.P., Staley, M.W., Becker, A.J et al. (2008) Brook trout declines with land cover and temperature changes in Maryland. 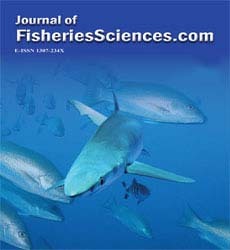 North American Journal of Fisheries Management 28, 1223-1232. Soulsby, C., Youngson, A.F., Moir, H.J., Malcolm, I.A. (2001) Fine sediment influence on salmonid spawning habitat in a lowland agricultural stream: A preliminary assessment. Science of the Total Environment 265, 295-307. Sowden, T.K., Power, G. (1985) Prediction of rainbow trout embryo survival in relation to groundwater seepage and particle size of spawning substrates. Transactions of the American Fisheries Society 114, 804-812. Statistics Canada (2015) Table 001-0014 - Area, production and farm value of potatoes, annual, CANSIM (database). Accessed 01 Sept. 2015. Waters, T.F. (1995) Sediment in streams: sources, biological effects, and control. American Fisheries Society, Monograph 7, Maryland. Witzel, L.D., MacCrimmon, H.R. (1983) Embryo survival and alevin emergence of brook char, Salvelinus fontinalis, and brown trout, Salmo trutta, relative to redd gravel composition. Canadian Journal of Zoology 61, 1783-1792.